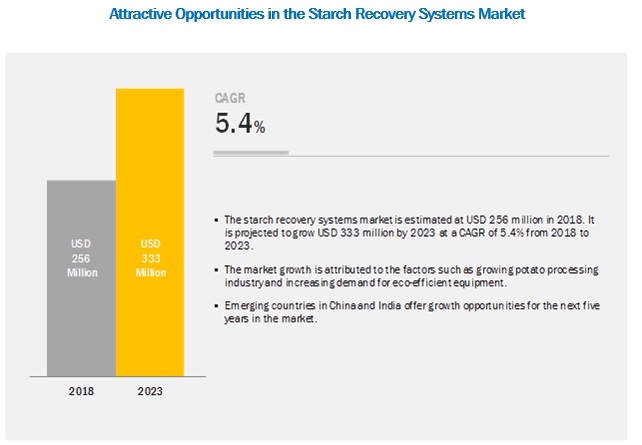 [131 Pages Report] The overall starch recovery systems market is projected to grow from USD 256 million in 2018 to USD 333 million by 2023, at a CAGR of 5.4%.The study involved four major activities in estimating the current market size for starch recovery systems. Exhaustive secondary research was done to collect information on the market, including the peer market. The next step was to validate these findings, assumptions, and sizing with industry experts across the value chain through primary research. Both the top-down and bottom-up approaches were employed to estimate the complete market size. Thereafter, market breakdown and data triangulation were used to estimate the market size of segments and subsegments. In the secondary research process, various secondary sources have been referred to, to identify and collect information for this study. The secondary sources included the annual reports such as the Potatoes USA Annual Report, the ICAR-Central Potato Research Institute Annual Report, press releases, and investor presentations of companies; white papers; certified publications; articles by recognized authors and regulatory bodies such as the USDA, the Potato Processing Association Of Australia (PPAA), the International Potato Center (CIP), and the Potato Association of America (PAA); trade directories; and databases, for instance, the European Cultivated Potato Database, ECPGR: The ECPGR Wild Potato Database, etc. Secondary research has mainly been used to obtain key information about the industry’s value chain and supply chain, the total pool of key players, market classification & segmentation according to industry trends to the bottom-most level, and geographical markets. It has also been used to obtain information on the key developments from a market-oriented perspective. The starch recovery systems market includes several stakeholders in the supply chain-suppliers, R&D institutes, and end-product manufacturers. The demand side of the market is characterized by the presence of importers/exporters; distributors; and manufacturers of potato-based products. The supply side is characterized by the presence of key providers of starch recovery systems. Various primary sources from the supply and demand sides have been interviewed to obtain qualitative and quantitative information. The industry’s supply chain and market size were determined through primary and secondary research. All possible parameters that affect the market covered in this research study were accounted for, viewed in extensive detail, verified through primary research, and analyzed to obtain the final quantitative and qualitative data. The research included the study of reports, reviews, and newsletters of top market players, along with extensive interviews for key opinions from leaders such as CEOs, directors, and marketing executives. After arriving at the overall market size from the estimation process explained above, the total market was split into several segments and subsegments. In order to complete the overall market engineering process and arrive at the exact statistics for all segments and subsegments, data triangulation & market breakdown procedures have been employed, wherever applicable. The data has been triangulated by studying various factors and trends from both the demand- and supply-sides. Along with this, the market size has been validated using both the top-down and bottom-up approaches. This research report categorizes the starch recovery systems market, based on component, application, plant size, and region. The overall starch recovery systems market is projected to grow from USD 256 million in 2018 to USD 333 million by 2023, at a CAGR of 5.4%. The growing potato processing industry is driving the starch recovery systems market. Moreover, the need for eco-efficiency in the food industry is also an important factor that is driving the growth of the starch recovery systems market. By component, the hydrocyclones and centrifuges segment is projected to be the largest contributor to the overall starch recovery systems market during the forecast period, in terms of market share. 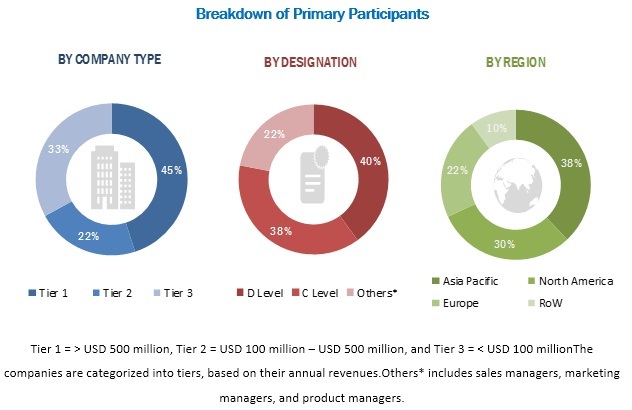 The starch recovery systems market has been segmented, on the basis of component, into refining sieves, hydrocyclones and centrifuges, vacuum filters, screw conveyors, filling stations, and others (spray dryer, plate heat exchanger, and desander). The hydrocyclones and centrifuges segment is projected to dominate the market during the forecast period, in terms of value; it is projected to grow at the highest CAGR between 2018 and 2023. The growing potato processing industry and preferences for eco-efficient processing are driving the starch recovery systems market. On the basis of application, the frozen products segment dominates the global starch recovery systems market. The starch recovery systems market is segmented, on the basis of application, into frozen products, chips & snack pellets, dehydrated products, and others (canned potato and potato flour). The market for the frozen segment is projected to grow at a significant CAGR between 2018 and 2023. The increased demand for frozen potato products is positively impacting the growth of the starch recovery systems market. By plant size, the large-scale potato processing industries are dominating the starch recovery systems market. The starch recovery systems market is segmented, on the basis of plant size, into large, medium, and small. Large-scale plants are focusing on an eco-efficient process of generating starch from potato wastewater, creating a demand for starch recovery systems. The availability of budgets is one of the major factors due to which the large-scale industries have become early adopters of starch recovery systems. The need to reduce wastewater treatment costs and to earn additional profits by selling the recovered starch are some of the reasons to install the starch recovery systems. These factors are boosting the demand for starch recovery systems in the market. Asia Pacific is projected to dominate the global starch recovery systems market during the forecast period. Expansion of the potato processing industry is driving the demand for starch recovery systems market in the Asia Pacific region. The potato processing industry in the Asia Pacific region is experiencing growth, owing to the increasing demand for processed potato products. Additionally, the potato processing industries have developed an inclination toward eco-efficient processing systems with better quality products and a reduced amount of industrial discharge, in recent years; this is also driving the market in this region. These factors are expected to create a potential market for starch recovery systems in the potato processing industry. Promising markets such as India and China, along with other Asian countries, hold great potential for the growth of starch recovery systems. Key players in the market include GEA (Germany), Alfa Laval (Sweden), Andritz (Austria), NivobaHovex (Netherlands), MICROTEC ENGINEERING GROUP (Australia), Myande Group (China), LARSSON SWEDEN (Sweden), Sino-Food Machinery (China), Flo-Mech (UK), Hiller GmbH (Germany), Flottweg (Germany), Stamex Technology (Thailand), and HAUS Centrifuge Technologies (Turkey). These players are increasingly undertaking new product launches, expansions & investments, and acquisitions & mergers to introduce and develop new technologies and products in the market and to expand their product portfolios in the untapped regions. In January 2018, Nivoba BV (Netherlands) and Hovex (Netherlands) announced the merger of the companies. This merger would enable the company to develop and strengthen its position in the global starch recovery systems market. In February 2017, Larsson Sweden (Sweden) launched a new range of rotary drum vacuum filters. The new filters are easy to clean and involve low maintenance cost and nominal operating care because of their highest automation and hygienic design. In March 2018, Alfa Laval (Sweden) opened a new production unit for brazed heat exchangers in Virginia, US. The new production plant would strengthen the company’s position in the North American market. In June 2018, Alfa Laval (Sweden) announced the launch of a new disc stack separator—UniDisc. This disc technology would increase the separation efficiency by 30%, due to the low spacing between the disc. In September 2018, Ferrum (Switzerland) announced the acquisition of Hiller GmbH (Germany). This acquisition would help Hiller GmbH to strengthen its position in the economically volatile market, as well as to expand its business in the Asian and North American regions. What are the upcoming industry applications for starch recovery systems? What is the impact of the potato processing industry on the starch recovery systems market? What are the new technologies introduced in starch recovery systems? What are the latest trends in the starch recovery systems market?